This posable human hand is a great reference tool for professionals and students who are practicing sketching and drawing. It also doubles as an attractive moveable sculpture. Standing at 12 inches tall, the articulated, posable wooden hand hand has moveable finger and wrist joints, and can be manipulated into countless poses to help artists accurately capture the right details of the human form. It is perfect for classrooms or studios. Constructed of durable hard wood to ensure durability and longevity. The hand measures 3.5 x 12 inches. 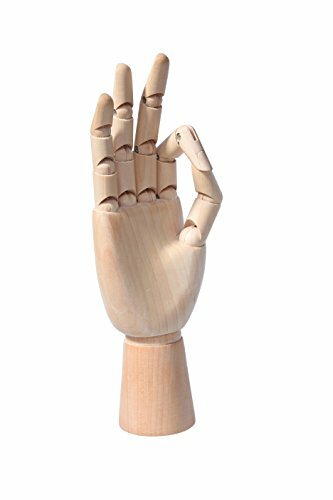 VERSATILE: This posable, posture adjustable wooden human hand is a great tool for learning how to sketch and draw. It can also be used as an attractive moveable sculpture for the use of commercial sample display. DETAILS: Standing at 12 inches tall, this articulated, posable hand is ideal for capturing accurate details of the human form; a must have for classrooms or studios. MOVEABLE JOINTS: The hand is sectioned with movable finger and wrist joints, and can be easily manipulated into countless poses. DURABLE: Constructed of durable hard wood to ensure durability and longevity. DIMENSIONS: 3.5 x 12 Inches.